Today I thought I would do a review on one of my favorite versatile bags that I frequently take with me when we travel. I’ve been receiving more questions about crossbody bag recommendations, and this is one of my favorites. The bag in question is the classic Chanel reissue, in the (I believe) tiniest size, the 224. Reissues start at 224, and go from 225, 226, 227, all the way to 228. 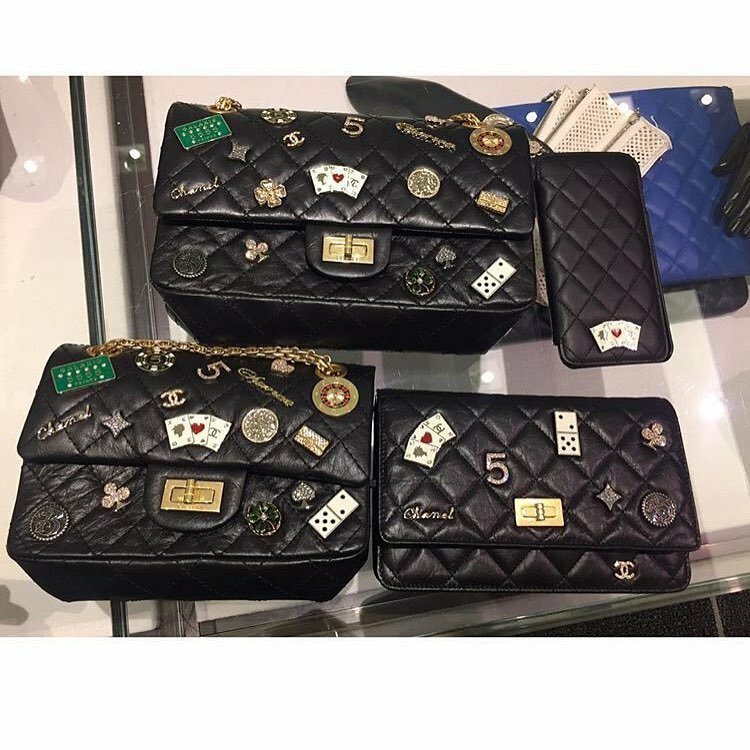 Chanel makes a lot of great “mini” bags including the popular “mini” flap and the wallet on chain, but I ended up choosing the reissue style in the end because the small size was essentially a smaller version of the larger bag, in everything from construction to design. A lot of the time I find that these smaller bags have made some tradeoffs in design (of course there’s usually a cost savings as well) – pockets are missing, or the strap is smaller, etc. The reissue in the 224 size has everything its larger siblings have – the double flap, zip pocket, front open pocket, leather lining. You probably have to be a lover of mini bags (as I am) to really like the 224. The bag, while small, I think holds a good amount for its little size. Just the essentials – my iPhone 6 Plus (yes with a case), a small card case (not pictured, I use the Citizen Twill from Hermes), sunglasses in a thin cloth pouch, and a lipstick. There’s a small pocket in the back that I use for tickets, a metro card, etc. And now..a demonstration of why I love this bag and bring it with me on travels often. you can wear it a bunch of ways…including crossbody! The best way to wear a bag while traveling, in my opinion. I also like that this little bag really easily transitions from day to evening….you can just double up the straps for a chic night out. The reissue can also be folded flat, though I can understand why some people might hesitate to do so. I do fold mine when I pack it in my carryon, and it’s always survived the flight easily. Overall, I can highly recommend this little bag – it’s a classic and one of my favorites that Chanel makes. If I had unlimited funds I would definitely be looking into another color – but for now I’m happy with my black! A big downside is the price. Chanel is of course always expensive. The 224 retails now for something like $4000 (last time I checked) – its equivalent on the classic flap side, the mini flap, is somewhere around $2700 I believe? That’s quite a difference! And wow, the prices just keep going up, every time I check. By the way – for a few alternate versions of this bag, I’d recommend the Stella McCartney Falabella for a fraction of the price (under $1,000), as well as the PS1 by Proenza Schouler (fits more as well), for under $1,400.